There are many holiday activities in and around downtown Bellevue this month. There’s still time to put some of these events on your “to do” list and make these events part of your holiday tradition. Yet another new restaurant, Henry’s Tavern, is scheduled to open August 30th at Lincoln Square. Henry’s Tavern is best known for its wide selection of beers on tap, its frosted bar rail to keep beers cold and a vast menu. This will be the sixth Henry’s Tavern for Restaurants Unlimited, Inc.
Henry’s opened in Portland in 2004 and expanded to Seattle in 2013 with a Sodo location. This is the second Bellevue location for Restaurants Unlimited, Inc. – the other is Palomino. The restaurant will be 11,000+ square feet with a 700 square foot patio and a keg wall – a two tiered glass cooler that has all kegs on display. Its arts and crafts fair time in downtown Bellevue. This weekend celebrates the 71st annual BAM ARTSfair, the largest arts event in the Northwest. This much anticipated event, with outdoor exhibits and events throughout Bellevue Square and the art museum, includes art exhibits, music, KIDSfair, a Sound and Movement Stage, BAMboozle Stage, Chalk It Up, food trucks and more. I love this time of year (second only to Snowflake Lane). Starting Thursday afternoon exhibitors will que up for check-in and start setting up their booths, the main level of Bellevue Square’s west parking garage will close to traffic and hotels and restaurants will be filled with artists, exhibitors and visitors. The fair literally takes over downtown for three days and no doubt moving around, either as a pedestrian or driver, will be challenging, and local restaurants and bars will be crowded – but its only for 3 days. This is the largest and most well regarded juried arts event in the Northwest and yes, it will be a bit of a hassle, but it’s an honor to have an event of this caliber in our city. Don’t miss the the other arts events this weekend – Bellevue is also hosting the Bellevue Festival of the Arts, located across the street from Bellevue Square at the Cost Plus World Market shopping area and the 6th Street Fair with exhibits along the Pedestrian Corridor and 106th Avenue NE. 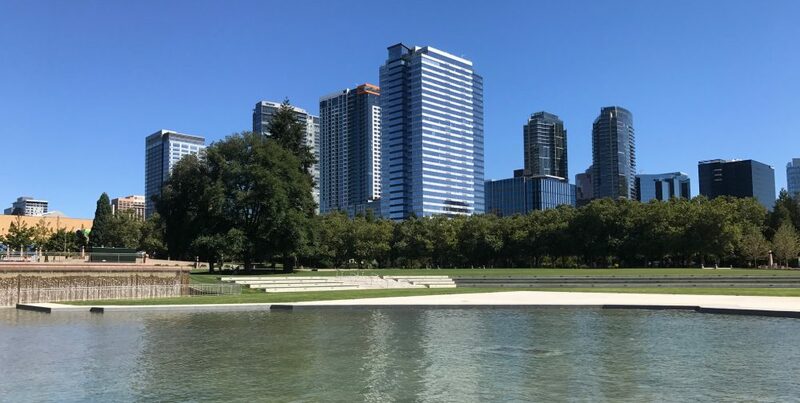 Downtown Bellevue’s free summer concert series kicked off last week with events planned for every Tuesday, Wednesday and Thursday, noon – 1:30 through September 14th. This week don’t miss . . . Pick up lunch, bring a friend and enjoy this summer’s concert schedule. Today is the grand opening celebration for Bellevue’s Downtown Park. Closed for the past year to complete a major renovation, the park will open just in time for the July 4th celebration and fireworks. For nearly 30 years the popular park has existed with an incomplete circular promenade and canal. During the last year work has been completed to create a grand entryway, water feature and terraced seating at the south end of the park, enhanced lighting and landscaping throughout the park and a new Inspiration Playground designed for children of all ages and abilities which was made possible through a partnership with the Rotary Club of Bellevue. Events include a ribbon-cutting with city officials, live music, including the Seahawks Blue Thunder band, food trucks and more. Free parking is available at Bellevue High School with shuttle service to and from the park. Its going to be a beautiful afternoon. Get out and enjoy the park. Take a look – here’s the June edition of the City of Bellevue’s Lake-to-Lake video. There’s a great overview and update about the Meydenbauer Bay Park construction, Bellevue’s gold courses and more. The Meydenbauer Bay Park, scheduled for completion fall 2018, is going to be a fabulous addition to the city’s access to the lake and the connection it will create to the Downtown Park and beyond.